In Burkina Faso, the AGC is working to bring positive changes to the country’s artisanal gold sector in innovative ways. The project will help the country to significantly reduce mercury use in ASGM mining and improve the lives of miners, in part, by developing responsible gold value chains that provide better incomes and opportunities to miners while incentivizing responsible ASGM production. Working with our local and international partners, the AGC will help to develop new financial tools that will allow miners to sell gold more directly to the domestic and international market while capturing a greater share of the value of the gold they produce. Increased revenues and state financing programs will allow miners to reinvest some of their profits in their operations and their communities to achieve positive social and environmental change. At the same time, the project will help to improve and where necessary, develop policy tools and local capacities to manage mercury use and steer the sector towards greater responsible gold production. Finally, we will build on the past success of our pilot mercury-free processing system in Zopal, by developing new programs to train miners in mercury-free techniques and supporting the replication of mercury-free systems across the country. Partners: GEF, UNIDO, the Burkina Faso Ministry of Mines and Energy Burkina Faso Ministry of the Environment, Argor Herraeus. This project is currently in the project design phase and is expected to begin in 2018. As the artisanal and small-scale gold mining (ASGM) sector is a major source of mercury release and environmental pollution in the world, the Minamata Convention requires countries which determine that ASGM activities are more than insignificant in their territory to develop a national action plan (NAP) to reduce, and where feasible, eliminate the use of mercury and mercury compounds within three years of the treaty entering into force. Within each country the AGC will develop a national analysis of the ASGM sector, including a baseline inventory of mercury use and mining practices. The analysis will provide the basis for identifying national objectives, as well as setting targets and strategies to eliminate worst practices and facilitate the formalization of the sector. The intent of working on each NAP is also to improve the health of the miners and ASGM communities by developing a public health strategy for the sector. The strategy will be based on the health situation and institutional capacity needs assessments that will be conducted by the AGC. Awareness will be raised on the risks of mercury use and also on the development of the NAP among relevant stakeholders. To conclude, the AGC will support these governments to endorse their NAPs, define schedules for their implementation and officially submit them to the Minamata Convention Secretariat. Partners: United Nations Industrial Development Organization (UNIDO) and the Global Environment Facility (GEF). This project builds on the successes of previous projects conducted by the AGC in West Africa. 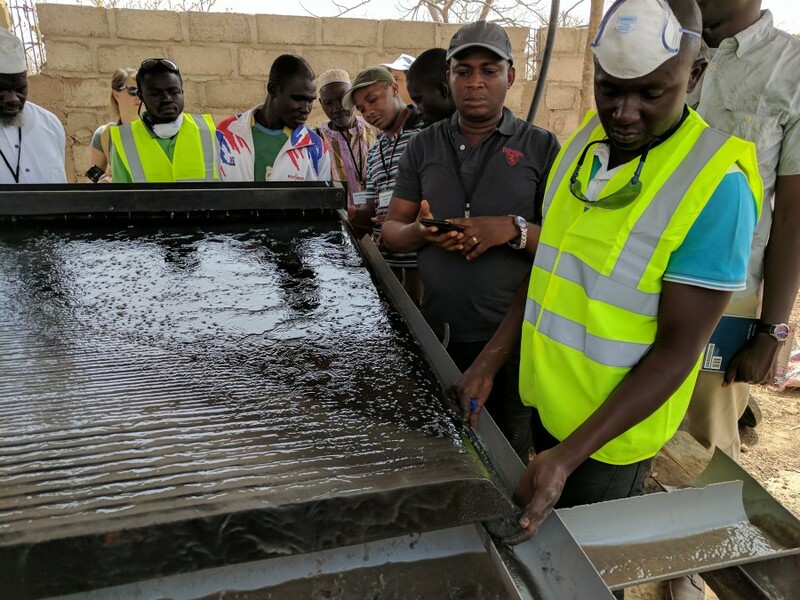 The successful installation of pilot mercury free processing systems in Zopal in Burkina Faso and Bantako in Senegal in 2014/15 has led to the development of this current West African project. In Senegal, this project focuses on maintaining the operational successes of the Bantako system by providing further miner training, both to the existing operational team, and to neighbouring miner groups to increase exposure and capacity in mercury free practices. A supply chain component will ensure the legal and transparent delivery of gold produced from the pilot system to international markets. In Guinea the project aims to produce national ASGM inventory estimates, and includes a scoping and feasibility component to assess the potential for future technical interventions. The Senegal portion of the project will provide technical support to the GIE Foukhaba, the mining group operating the AGC’s pilot processing system and training center in Bantako. This support will include further training on machine maintenance and direct smelting of gold concentrates, work begun during previous AGC projects. Additionally, mercury free processing workshops for miners from surrounding communities will be held on the Bantako installation site. Interested mining groups will be brought to site for demonstrations and training to increase exposure to best practices in mineral processing. A supply chain component of the project will develop the infrastructure required to bring the gold produced from the Bantako system from mine to market, yielding miners a better price for their gold than currently received in the field, and bringing a new stream of socially responsible mercury free artisanal gold to international markets. As the artisanal and small-scale gold mining (ASGM) sector is a major source of mercury release and environmental pollution in the world, the Minamata Convention requires countries which determine that ASGM activities are more than insignificant in their territory to develop a national action plan (NAP) to reduce, and where feasible, eliminate the use of mercury and mercury compounds within three years of the treaty entering into force. Within each country the AGC will develop a national analysis of the ASGM sector, including a baseline inventory of mercury use and mining practices. The analysis will provide the basis for identifying national objectives, as well as setting targets and strategies to eliminate worst practices and facilitate the formalization of the sector. The intent of working on each NAP is also to improve the health of the miners and ASGM communities by developing a public health strategy for the sector. The strategy will be based on the health situation and institutional capacity needs assessments that will be conducted by the AGC. Awareness will be raised on the risks of mercury use and also on the development of the NAP among relevant stakeholders. To conclude, the AGC will support these governments to endorse their NAPs, define schedules for their implementation and officially submit them to the Minamata Convention Secretariat. Partners: United Nations Environment (UNE) and the Global Environment Facility (GEF). Under the Minamata Convention on Mercury, all countries with more than insignificant mercury use in Artisanal and Small-scale Gold Mining (ASGM) are required to develop a National Action Plan (NAP) to address mercury use in the sector. A key component of the NAP is the development of baseline estimates of mercury use. The sector must be well understood to allow the development of clear and meaningful objectives and strategies for reducing mercury use. Conducting a baseline inventory for mercury use allows the opportunity to gather significant insight into the operations of a country’s ASGM sector. The AGC have developed a general methodology for conducting baseline inventory estimates of a country’s ASGM sector, while simultaneously collecting the general information on the practices applied and spatial distribution of ASGM needed to inform the development objectives and strategies for mercury reduction required under the NAP development. To assist other executing agencies with the development of their baseline inventory estimates, and in collecting the information needed to inform the meaningful development of National Action Plans, the AGC have developed an in depth ASGM sector assessment training, focused largely on producing baseline inventory estimates. The training consists of classroom trainings introducing common practices in ASGM, the AGC inventory methodologies, tools and approaches for data collection, and presents a case study of a completed ASGM inventory. The classroom training is followed by site visits to practice data acquisition in the field, and to gain exposure to the realities of ASGM extraction and processing practices. This field component is followed by a final classroom session to review the data collected, practice producing inventory estimates using the real field data collected, and to begin the discussion for the development of a country specific ASGM inventory approach. Partners: various local agencies – ongoing project. The Artisanal Gold Council were contracted by the Natural Resources Defense Council (NRDC) to assist in preparing a team of local Ghanaian inventory specialists to conduct baseline mercury inventory work for the Ghana NAP. NRDC are the executing agency of this NAP, and are working closely with local partners and NGO Friends of the Nation (FON) to complete the baseline mercury inventory. The training was completed from March 7-10, 2017. The training consisted of a one day classroom introduction to ASGM and inventory methods for a group of 10 stakeholders from various organizations including government, academic institutions, NGOs, and miners and mining organizations. This initial classroom introduction was followed by two days of field training including visits to 4 separate ASGM sites (both extraction and processing), to introduce participants to the field realities of ASGM, field data acquisition techniques, and to practice collecting inventory data from the field. A final day of classroom training was conducted to review the field data collected and practice producing site specific ASGM inventory estimates. A follow up discussion was included on next steps to developing a country specific baseline inventory estimates, and key steps to the initial national level assessment of the sector. The trainings have prepared the inventory group of five members from FON to develop the inventory methodologies for Ghana, and to collect field data from key regions once the specific methodologies for the Ghanaian context have been defined. Other members of the training will provide assistance and insight into the various ASGM regions of Ghana during the national level scoping to assist FON in developing the best country specific approach considering timelines and budget available. The information collected during the baseline inventory work will provide fundamental insight and information, guiding the development of strategies and objectives for mercury reduction, to be included in the final Sierra Leone NAP document. The Artisanal Gold Council were contracted by the United Nations Institute for Teaching and Research (UNITAR) to assist in preparing a team of local Sierra Leonean inventory specialists to conduct baseline mercury inventory work for the Sierra Leone NAP. UNITAR are the executing agency of this NAP, and are working closely with local partners, the Sierra Leone Environmental Protection Agency (EPA), to complete the baseline mercury inventory. The training was completed from March 13-16, 2017. The training consisted of a two day classroom portion introducing ASGM and inventory methods to a group of 20 stakeholders from various organizations including government, academic institutions, private sector, NGOs, community groups, miners and mining organizations. The classroom training was followed by one day of field training, and a final classroom session to review field data collected. Field training was completed with four local ASGM specialists to prepare workers for field data acquisition. The trainings have prepared a key group of stakeholders with the knowledge, skills, and tools required to develop a Sierra Leone specific approach to produce baseline inventory estimates, and to collect the data needed to produce these estimates. The information collected during the baseline inventory work will provide fundamental insight and information, guiding the development of strategies and objectives for mercury reduction, to be included in the final Sierra Leone NAP document. The AGC worked with UMaT to develop, improve, and introduce direct smelting technology to groups of miners who use mercury to recover gold. Over the past five years, UMaT has successfully developed a direct smelting kit which has been provided to miners at subsidized rates. This work has demonstrated that purifying gold without the use of mercury is possible in this context. The kit consists of an efficient furnace, a few common compounds, and some other tools which enable gold concentrates to be directly smelted, thereby avoiding the mercury amalgamation step. This project focused on testing, adapting, and improving the technology, as well as introducing the direct smelting approach to a wider audience. Education on the negative health impacts of mercury was delivered along with training on the direct smelting technology. Partner: University of Mines and Technology (UMaT), Tarkwa, Ghana.